A full mouth debridement is a dental procedure that removes excess plaque and tartar that have built up in your mouth for years. This can happen when you haven’t seen the dentist in a long time, even years. Without regular dental visits, massive plaque and tartar buildup will not be removed with a simple dental cleaning. This is where a dental debridement comes in handy. 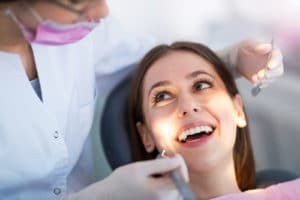 Because of these massive plaque deposits, it’s really hard for your dentist to accurately assess your tooth and gum conditions. If you are curious how a full mouth debridement works, we have all the information that will quench your curiosity. How does plaque and calculus buildup? Most people will brush, floss, and use their mouthwash to take good care of their teeth on a daily basis. However, we are not perfect and there could be some flaws in our brushing techniques. For example, if we use warned out brush, inappropriate brushing technique, or too lazy to brush twice a day, it can lead to a buildup of plaque and calculus. Plaque is a soft and sticky substance that contains bacteria and it’s by-product. It forms around your teeth after you eat. Calculus is also known as tartar, it’s hard and contains mineralize deposits that form a cement around the teeth. It originates from Plaque and builds ups. When we brush properly, we reduce the amount of plaque and tartar in our teeth. However, the build-up can be a gradual process and brushing may not be enough at times. This is why we visit the dentist every six months to get it removed. How does a full mouth debridement work? A debridement will generally take longer than a regular cleaning. Keep in mind that this built-up can spread to your gum and damage it. This can result in serious gingivitis or Periodontal disease. The dentist or the hygienist will use an electronics scaler to scrape off the deposits from your teeth. After the plaque and tartar have been scraped off, the dentist will do a general cleaning. After that, they will be able to assess your oral health. Depending on the condition of your teeth, you might require fillings, root canals, treatment for gingivitis, periodontal disease, or any treatment to revitalize the health of your teeth. Sometimes, it will take multiple dental visits to fix your teeth depending on how bad it is. A regular cleaning is a prophylaxis to remove all of the plaque, calculus, and stain from our teeth. It is done by using instruments that scrape the tartars and plaques from our teeth. The procedure is often done on tooth structures that have not been damaged by bone loss, infection, or periodontal disease. A regular cleaning is recommended for people that have light deposits. If you have dense deposits, you will need a debridement. It is the removal of heavy plaque and tartars that interferes with the dentist’s ability to perform a comprehensive oral evaluation. This is where dental instruments and devices will be used and the amount of time to complete the procedure takes way longer than a regular cleaning. In fact, multiple visits might be needed to finish the job. Will my insurance pay for a debridement? Dental insurance usually pays for regular teeth cleaning and check up that occurs twice a year. They do not cover procedures, cleaning, fillings, implants, or other treatment. However, there are dental plans that are more pricey and tend to be intended to have a more thorough coverage. It depends on what dental insurance that you purchased. Some might cover debridement or a certain percentage of debridement, whereas others will only cover regular cleaning. It really depends on what dental insurance you get. Why can’t I just do a regular cleaning instead of a debridement? Regular cleaning is not adequate enough to get rid of heavy plaque and tartar. It can cover up underlying issues that require immediate treatment. If the dentist cannot diagnose a cavity or gum disease because of these heavy plaques, it can be detrimental for your oral health. Untreated cavities or gum disease can result in severe pain and agony in the future. It will be very hard to diagnose and treat if there are heavy plaque and tartar getting in the way of fillings and other proper treatment strategies. It is advisable to do a full mouth debridement to get rid of this heavy plaque and tartar so the dentist can accurately diagnose and treat cavities, gum disease, or any potential dental problems. At EVDP dentistry, we have one of the most experienced dentists on board. Through a thorough assessment of your teeth, our dentists will be able to tell if you will need a full mouth debridement or not. Rest assured, we are skillful and experienced with the debridement process. We will rid your mouth heavy plaque or tartar buildup that has been around for ages. Afterward, we will be able to diagnose you properly and provide the adequate treatment that will revitalize your oral health. Your oral health deserves the best, so give yourself the best with EDVP dentistry.